By far the most comprehensive work on remedy relationships, in which the author does not simply describe which remedies follow a particular remedy well, but differentiates these according to the symptomatology. An outstanding work ideally suited to practical use. It features complementary remedies, inimical remedies, antidotes, follow-on remedies, and intercurrent remedies, supplemented with the side affected (laterality), duration of action, miasm, and foods to be encouraged or avoided. In the daily homeopathic practice it is often not enough to find the right remedy. Especially in chronic diseases which have been treated already, it is quite frequent that a complementary remedy or a series of remedies in sequence is needed to cure them, keeping in view the changed symptom picture. This is the first comprehensive handbook on remedy relationships. The list of complementary, successive and inimical remedies, antidotes and collaterals is supplemented by data on interactions, duration of action, food which has to be avoided, references to miasms and practical tips on the use of the remedies. The clinical notes on the quality and the special characteristics of the respective remedy relationship are especially helpful for choosing the right remedy. Dr. Rehman has drawn the information from a wide variety of books in English, German and French which are referenced in the text. The book is an excellent complement to the homeopathic materia medica and a useful guide for the second prescription. It belongs on the reference shelf of every homeopathic practitioner who treats difficult chronic conditions. The accumulated store of knowledge about remedy relationships is a vast one, and swift and easy access to it is a sure-fire way of boosting your success rate in prescribing. For two hundred years homoeopaths have been noting down which remedies followed on well from a first prescription, which ones had an acute/chronic relationship, and which remedies could be tried if an apparently well-indicated prescription failed or had to be antidoted. When reliable, this kind of information can be so priceless that it may feel like cheating to make use of it. After years of having to make do with outdated and incomplete listings of reme­dy relationships such as those of JH Clarke or PS Sankaran, this absolute gem of a book came out and since then it has never strayed far from my reach. 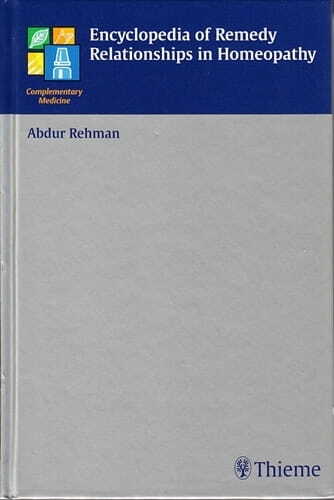 Basing his work on Clarke's century-old (and monumen­tal in its time) Clinical Relationships, Dr Abdur Rehman of Lahore, Pakistan has spent sixteen years trawling through 274 addi­tional homoeopathic refer­ence books by 180 authors writing in English, German, French and Urdu. The result is undoubtedly the most complete account of remedy relationships ever compiled. He has referenced each observation to its author, giving the user of this book full control in the matter of the reliability of sources, which in such a comprehen­sive encyclopaedia is bound to be somewhat uneven (although I would not want to throw out a single author). The range of information given for each remedy is as complete as the book itself: Miasm, Temperament, Laterality, Related bowel nosode, Duration, [general] Remarks, Foods to be avoided, Foods to be encouraged, Complementary remedies, Followed well by, Inimical Antidotes, and Collaterals. The references are laviously annotated with thousands of clinical hints from the various authors. Some of course can be taken with a pinch of salt, but a lot are, quite frankly, gold dust so long as you approach them with common sense and an open materia medica. A substantial index of clinical conditions rounds off the book and enables it to be used as a sophisticated therapeutics tool if you so wish. As is to be expected of any Haug Verlag publication, the Encyclopaedia of Remedy Relationships is simply but tastefully designed and solidly produced and bound with a view to the years of hard wear your copy will undoubtedly receive. It is also very expensive but money fades into insignifi­cance before an Aladdin's Cave of homeopathic trea­sures such as this. Thanks to Dr Rehman for this labour of love which at a stroke makes the often difficult subject of homeopathy considerably easier to succeed in.